Posted by Nancy Ness on November 26, 2017. Plato once said, “All learning has an emotional base”, yet many of us wish people’s emotions would just evaporate from the workplace. On the other hand, if that were to take place, we’d be missing out on valuable productivity drivers like passion, vision, mission, and even the drive to improve. Emotions in the workplace are our greatest friend, and can also be our greatest obstacle to workplace productivity. If everyone worked by themselves in the job they love, there would be no discussion or concern of emotions in the workplace. However, people work with other people, and those people have emotions, and we have emotions, and our boss has emotions, and our peers have emotions. And when any of these other people knowingly or unknowingly do or say something that doesn’t agree with (or worse BLOCKS) the ideas, dreams, or passions of another, then . . . well, you know what happens next. Yet despite this potential for conflict, don’t avoid the role Emotional Intelligence plays in your organization. The practice of how emotions affect one’s work performance dates back to the first job position, whenever that was! The study of this interaction is relatively new in comparison to how “old” work is. The Industrial Revolution forced leaders of organizations to face the role of emotions in the workplace. Studies abounded trying to answer the question, “How do we get our employees to produce more?” Ideas ranging from changing the lighting to the timing and frequency of “breaks,” to modifying physical structure of the production line were all rooted in trying to achieve the goal of getting more productivity out of employees. Until . . . someone had the brilliant insight that employees have emotions and those emotions are rooted in their dreams, passions, and their own ideas. Yes, employees were not just machines, they were human and these humans had emotions; and the amount and degree of emotions were directly related to how much they produced. Coming full circle, these emotions found their root in the human’s ideas of what they found to be enjoyable . . . and what they were passionate about. 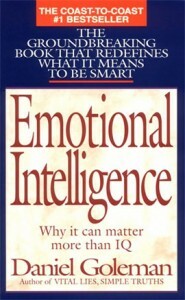 Two such pioneers into this psychological study were Peter Salovey and John D. Mayer when, in 1990, they published their influential article Emotional Intelligence. They identified four branches of emotional intelligence that they believe guides one’s thinking and actions. Perceiving Emotions: In many cases, this might involve understanding nonverbal signals such as body language and facial expressions accurately. Reasoning With Emotions: Emotions help prioritize what we pay attention and react to; we respond emotionally to things that garner our attention. Understanding Emotions: Often times, people misinterpret the cause of one’s emotions and are misguided in their response. For example, if your boss is acting angry, it might mean that he/she is dissatisfied with your work; or it could be because your boss got a speeding ticket on their way to work. Managing Emotions: Regulating emotions, responding appropriately and responding to the emotions of others are all important aspect of emotional management. Would you like to experience this more often? Then let us help you to maximize your team’s Emotional Intelligence. It’s a skill that can be learned . . . so let’s get started.